Hanoi (VNA) – Ambassador Nguyen Tam Chien, President of the Vietnam-US Society hosted a reception in Hanoi on March 18 for a delegation from the Veterans of Foreign Wars of the US (VFW), who are on a Vietnam visit from March 15-23. 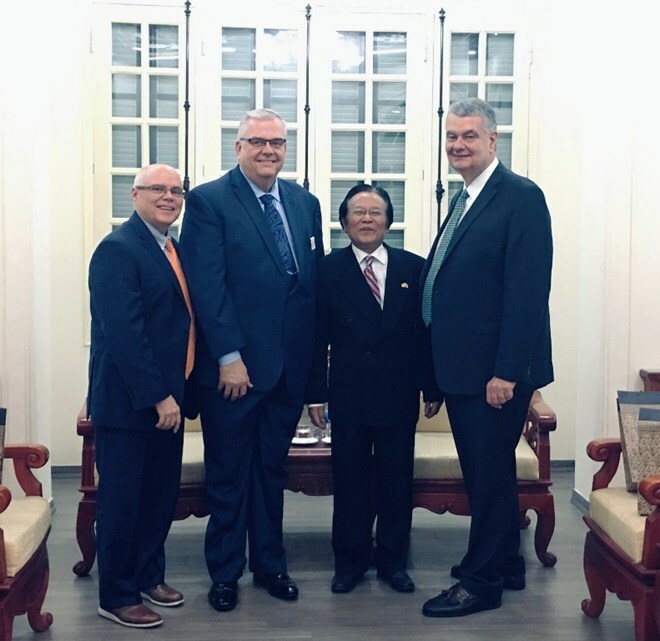 Chien briefed the delegation on Vietnam’s current situation, its foreign policy, Vietnam-US relations, as well as activities conducted by the Vietnam Union of Friendship Organisations (VUFO) and the Vietnam-US Society (VUS) in promoting people-to-people exchanges. At the reception, delegation members showed interest in economic collaboration between the two countries’ organisations and veterans, as well as measures to tackle post-war consequences in Vietnam such as bombs and mines, unexploded ordnance, and Agent Orange. Chien affirmed that the VUFO and VUS will create all favourable conditions for the delegation to help it have an effective visit to Vietnam. VFW is a nonprofit veterans service organisation comprised of eligible veterans and military service members from the active, guard and reserve forces. Established in 1899, the organisation now has 1.7 million members with nearly 8,400 branches around the world.